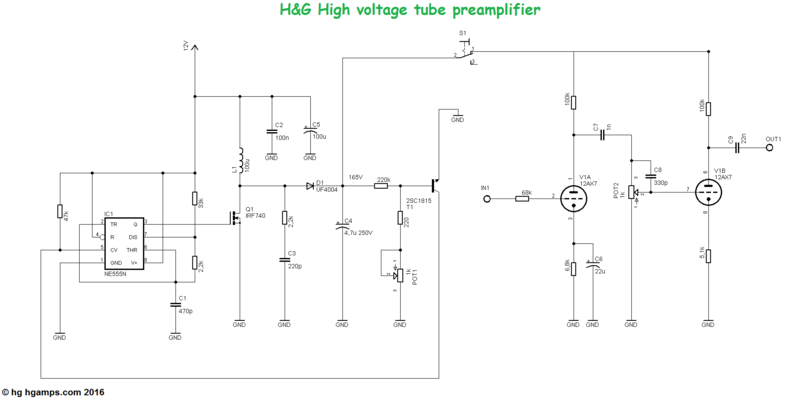 The high voltage tube guitar preamplifier project is an adaptation of the famous tube preamplifier to suit the DIY’ers demands. Searching the net, I’ve never come across similar idea, so I decided to share this version of our very popular design. This a classic, conservative design, that easily matches other musical devices. 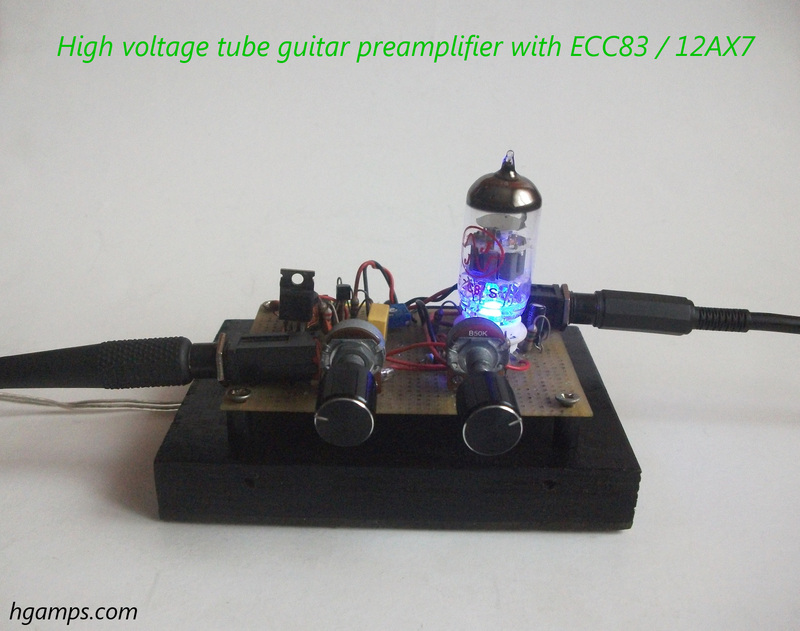 The preamp contains one channels of real-tube, high-gain circuit. This circuit uses JJ ECC83 (12AX7) tubes. Circuit uses a stabilized 12V DC voltage. The signal path contains only tube and passive components, to preserve your signal real form. Different from many “tubed” consumer products. And what kind of voice? A typical tube amps, warm tone. A little “bright” sound. The 555 based circuit generated HV. This has already beenaddressed. The D1 diode is definitely one fast schottky diode. The voltage adjusts the potentiometer P1. The switch S1 is an important element. This is a standby switch, it helps to have a longer service life of the pipe. After connecting the power, wait for the tube to warm up, this about 30 sec. Only then turn it to the 165V voltage. There is an additional volume potentiometer after the C9 capacitor, not shown in the drawing. L1 inductor least 1A ! If you are less then warms, it can be dangerous. The power cords are wrapped and properly arranged. The C7 and C8 we use film type capacitor (NOS Stiroflex or polystyrene, very nice voice!) but instead ceramic is recommended. Attention! The circuit operates at high voltages! H&G Amplifiers shall not be responsible and disclaims all liability for any loss, liability, damage (whether direct or consequential) or expense of any nature whatsoever, which may be suffered as a result of, or which may be attributable, directly or indirectly, that you use of the circuit. During construction and use will be very careful and cautious! I will try to update this page reguarly if anyone shows interest in its topics. Comments and corrections are extremely welcome. If you build this project and describe elements of the process, I’ll be more than happy to add it – or a link to it – here, so others can benefit from your experiences.